Robert Jackson Bennett knows how to make a damn good sandwich. I find mythology tragic, yet addictive. It’s like a scab I can’t stop picking at, a trainwreck I can’t look away from. The more we tell these beloved and culturally powerful stories, the more we trap their inhabitants. One of my favorite examples of this is Loki (Fenrir is another). He is trapped in his destiny, he can’t make other choices or do other things, even if he wanted to. And every time his story is told, the shackles get tighter. As storytellers, we need him to be a particular archetype, we need him to act a certain way, to be a certain lever of the world as we know it. Because otherwise, the myth wouldn’t have the desired effect. Mythologies are cultural artifacts of incalculable value, and as we gain strength and inspiration from their telling we enslave the characters within the myth, because we know how the story has to end. Confused yet? Excellent. Let’s talk about City of Blades. City of Blades is both a very easy book to talk about, and yet a very difficult one. It easily falls into my favorite category of books, those “that aren’t what they say they are about”, which makes it very easy to talk about without spoiling important plot bits. However, it is hard to talk about, because there are intimacies and honesties in this book that as a reader, I feel I have been trusted with. I do not want to betray that trust by mis-speaking about someone’s experiences. I just realized I am treating Bennett’s characters as if they are real people. I talk about not wanting to betray someone’s trust, yet that someone is a fictional character, whose life and secrets are available to anyone who wishes to turn the pages of her life. You know what? I like thinking about Turyin Mulaghesh as a real person. It’s a comfort, to give that kind of weight to her life, and to the lives of the other characters in the book. Both this new novel, and it’s predecessor City of Stairs, reminded me a little of Cordwainer Smith – as in both Smith and Bennett flat out refuse to follow any of the expected and so-called “rules” of the genre in which they are writing. Both authors write as if there simply are no rules or conventions, as if no one ever took them aside and said “you know you’re not supposed to present this type of story this way, right?”. 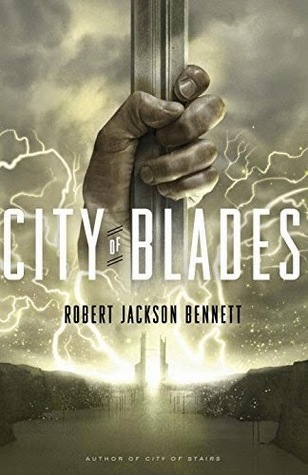 With City of Blades, Bennett takes it one step further and joins Seth Dickinson in dragging an eraser through the genre, erasing the so called rules and conventions. The original fifty thousand residents of the generation ship, known as the Ark, were chosen for their intelligence and skills. These were the families we wanted to restart humanity with after we learned a black hole was headed straight for Earth. Eleven generations later, the total number of humans is still around fifty thousand, thanks to strict population controls. It’s a pretty boring journey for the most part, so everyone finds entertainment where they can. Watching Zero, a ballgame played in the low G of the center of the ship, is hugely popular. One of the game’s most famous players, Bryan Benson, grew up to become a detective. Fame has it’s bonuses – everyone is usually very happy to see Benson on their end of the ship, and he usually gets free drinks at the bar because his autographed photo is up on the wall. Generally speaking, life on the Ark is pretty easy. Sure, there’s politics and gossip and sports and such, but in general very little changes. How much can life change, when you live in a tin can and families and child rearing are done only by approval? If you’ve seen the TV miniseries Ascension, the environs of The Ark feel similar. Before I get into the plot of the novel, I want to tell you about the Ark ship, because it’s awesome. The propulsion system is basically Project Orion on crack. Nuclear bombs are detonated out the back end of the ship, and the force of the explosion pushes the ship forward. It sounds crazy, but it works. Tomlinson really did his research when it comes to both the design of the ship, astrophysics and how gravity changes in different areas of a rotating habitat. One of the opening scenes involves an EVA outside of the ship that could have easily been botched. But thanks to the author’s understanding of physics, the EVA scene firmly solidifies the legitimacy of the worldbuilding. I really loved the ship, how it works, and the other tech that the author dovetailed into our future society. I don’t often step outside my comfort zone. It might seem like I do, but I don’t. Sometimes I need a little nudge, and sometimes that nudge comes in the form of the right conversation at exactly the right moment. I met author Christian Klaver at Confusion, and came home with a few of his books. Two of them were skinny little novellas, I could read these in an afternoon, right? One had Count Dracula on the cover, the other made reference to Lovecraft. Sounds right up my alley, right? Not Quite. These are Klaver’s Supernatural Sherlock Holmes mysteries. I’m all for a smart thriller, and I’m all for anything Innsmouth, but Sherlock Holmes? Judge me as you will, I’ve never read any Sherlock Holmes. I couldn’t even get into the new TV show. Totally lame, right? Only way to fix it was to jump into some Holmes, and out of my comfort zone (why is this stuff outside my comfort zone? I actually have no idea). Like many of the original Holmes novels (thanks Wikipedia! 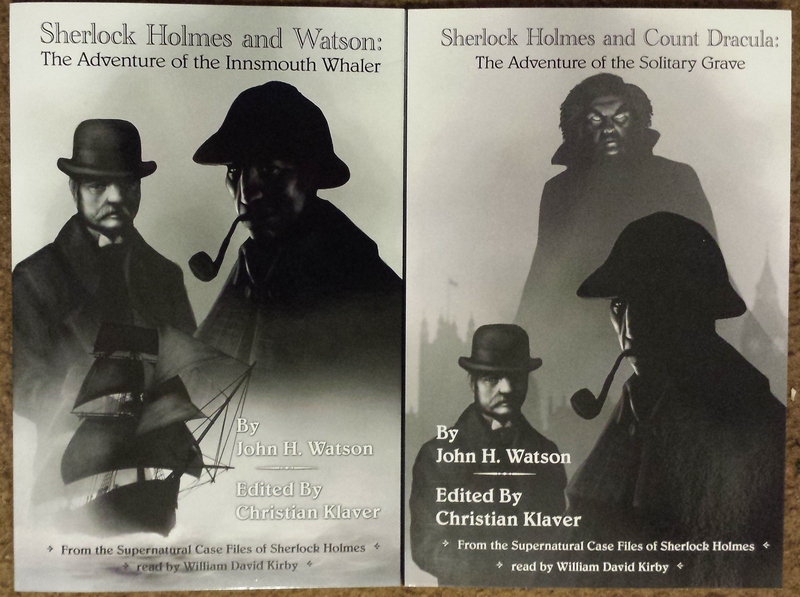 ), The Adventure of the Solitary Grave and The Adventure of the Innsmouth Whaler are narrated by Dr. Watson. He’s telling these stories late in his life, after the death of Holmes. The two of them had agreed that these supernatural stories were far too unbelievable, but that after the death of the famous detective, the stories should be told. I really wasn’t sure what to expect, stodgy dry prose? Over-ornamented and boring dialog? Like something out of a play? Whatever it was that I expected, I got something completely different. I imagine that Klaver is a huge Holmes and Arthur Conan Doyle fan, and modeled his Watson and Holmes off the originals. What’s important here is that I quickly came to enjoy Watson’s voice and story telling style. These two stories were easy to get into, and highly enjoyable to read. If you are going to read these, you need to read them in order. Read The Adventure of the Solitary Grave first (I just realized I photographed the books in the wrong order), because there are two events that take place that color the rest of Watson’s life and make permanent changes to his professional habits. Of the two, my favorite was The Adventure of the Innsmouth Whaler. I’ve read my share of Lovecraft and Lovecraftian inspired fiction, and it was quite funny to hear Holmes guesses as to what was going on. He even tries to contact the authorities in Innsmouth and Arkham, and is puzzled by the useless responses. Even with his powers of deduction he can’t quite fathom what’s happening. Watson has the advantage here, as he’s more open to the idea of something beyond the understanding of man. Hitting up the used bookstores is much more fun with a friend in tow. 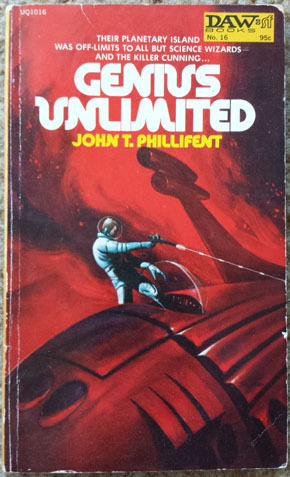 Otherwise how would my friend have had the opportunity to recommend John T. Phillifent’s Genius Unlimited to me? A what a fun and entertaining book! Interstellar Agents Rex Sixx and Roger Lowry always get the crap jobs, the gigs that no one else wants. This new bodyguarding assignment seems like a cakewalk, so why did it fall in their laps? This should be as easy as the furlough they just came off of. The secretive colony of Iskola has asked for assistance and consulting, and all Sixx and Lowry need to do is get special agent investigator Louise Latham to Iskola on the planet Martas, make sure no harm comes to her while she is consulting with the Iskolans, and bring her home. What could possibly go wrong? To start with, Miss Latham isn’t your average investigator and Iskola isn’t your average colony. But at least Sixx and Lowry already know a little about Iskola. A private island colony, the only way to gain residency is to pass a battery of tests and prove you are a genius. Privacy is a very big deal there, and no one seems to be sure exactly what happens on the island other than genius residents solving problems and minding their own business. Iskola brings in an income by consulting on large problems, such as the recent one of erosion and soil degradation on the mainland continent. That one in particular was a disaster, because the agricultural experts on the mainland weren’t interested in being told that their slash and burn methods of deforestation had destroyed the thin layer of topsoil. Even a genius can’t be telling an expert how to do their own job, now can they? Every so often we all need a fluff read. You know, something that will entertain you without challenging you? 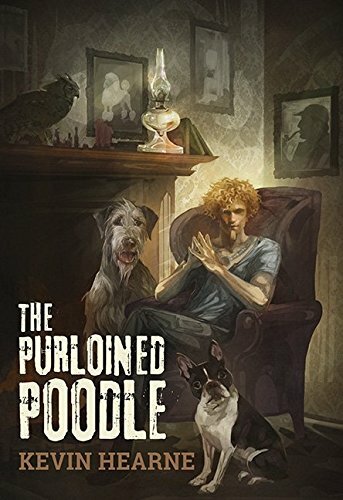 Fluff reads for me are usually media tie-ins, and the best kind of fluff read is a direct novelization of a comic book or movie that I liked. 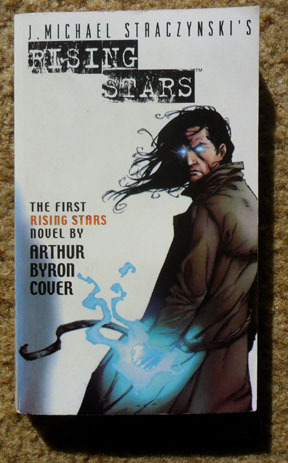 A few years ago I read J. Michael Straczynski’s Rising Stars graphic novels, and loved them. I don’t usually go for superhero stories, but Straczynski is alittle like Whedon for me – if he writes it, I am probably going to like it no matter what the subject matter was. The novelizations of the graphic novels are by Arthur Byron Cover, but like the artists of the graphic novels, Straczynski’s story and backstory are the star of the show. It’s a little sad, actually, that I had no idea from reading this if Cover is a good author or not. But again, that’s the nice thing about really fluff novelizations – I don’t need to worry about if the author is any good or not. Cover does flesh out the world building and a lot of the character background, which I appreciated. For example, we get much more information about the political situation of the country in the late 1960s, far more time is spent follow the children during the 1970s, and characters get more inner monologue and depth. In the late 1960’s, a meteor crashed to earth, exploding over a small midwestern town. No one thought anything of it, until a few years later. You see, all the children who were in utero at the time of the meteor were imbued with special powers. Some kids could fly, some kids were invulnerable, some kids had telepathic powers. One hundred and thirteen Special children, all who could do something different. Or least, mostly. Some children who were born right on time never manifested anything. Who knows, maybe there wasn’t enough special powers to go around? The government descends on the town to study the children, and keeps them at a local summer camp turned boarding school. I really liked the dynamic of that these children gained superpowers simply by being in the wrong place and the wrong time. None of them have any of the classic or expected comic book superhero youth stories. None of these kids are orphans, none of them are wealthy heirs, none of them are aliens or anything. Their parents and their older siblings and their neighborhood was completely normal. But these kids are Specials. As the kids manifest and develop their powers, the government needs to ensure the Specials use their powers for the good of the country. But who decides what’s good? In an alternate early 1900s, in an amazing metropolis in the Pacific Northwest, a new industrial revolution has begun. In Evesden, The McNaughton Corporation holds patents for the most amazing technologies, everything from airships to subterannean trolleyways, to telecommunications. The Corporation holds their secrets dear, and at times has held the world hostage, and that same world flocks to Evesden and the McNaughton Corporation with dreams of a better life and a career with the company that is reinventing the world. Found in an Indian prison and given a life of luxury in Evesden is McNaughton’s most valuable employee, a Mr Cyril Hayes. Hayes works from the shadows, making the corporations problems disappear. He spies, he blackmails, he knows better than to ask questions of his superiors, and they know better than to try to keep him out of the opium dens or to let on that they know he shares information with the cops. Hayes’ newest assignment comes with an assistant, the young and sheltered Samantha Fairbanks. She’s his secretary, but she’s also supposed to keep him under control and out of trouble. Their mission is to interview employees suspected of Union organization. No arrests, no threats, no mention of Unions, just talk about how everything has been going lately. Hayes sits in on the interviews, but he isn’t really listening. At least, not with his ears. There’s a reason Hays lives alone in a giant warehouse, there’s a reason he’s anti-social, there’s a reason he escapes into hazes of opium and alcohol. The longer Hayes spends with someone, the more the person’s thoughts invade his mind. It becomes easier and easier for Hayes to talk like that person, act and walk like that person, become that person’s new best friend, their confidant, their confessor. Hayes can count on one hand the number of people who know about his ability. the way people react to Hayes when they find out what he can do gave certain scenes almost and X-Men type feeling for me. Hayes closest friend Inspector Garvey is completely accepting of the fact that Hayes can “read minds”, while Hayes’ supervisor refuses to be close quarters with him for more than a few minutes. Others respond with anger, disgust and fear. There’s a point where in the eyes of the company Hayes ceases to be an employee, and becomes a thing, a tool, a weapon, a closely guarded and dangerous secret. The saddest thing, is that he knows it.